Our polishing cloths are ideal for treating surfaces before sealing with Percenta sealants. They are also ideal for subsequent polishing. It is important to remove any fibre remains before sealing. Our cleaning sponges are ideal for cleaning all surfaces before applying a nano sealant. 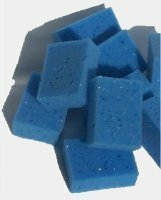 These sponges with water and any of our cleaners, dissolve grease, surfactants and other contaminants. After cleaning, the surface has to be washed off thoroughly with water to remove all dissolved contaminants. Before applying a sealant it is important to make sure that the surface is clean, dry, grease and surfactant free.